The Nova Aurorum Subsector takes its name from the powerful mercantile Garden World that sits at the heart of this dense cluster of interdependent star systems. For almost 5,000 years, the Lightbringers Chapter have made their home here in the Vesynia system. 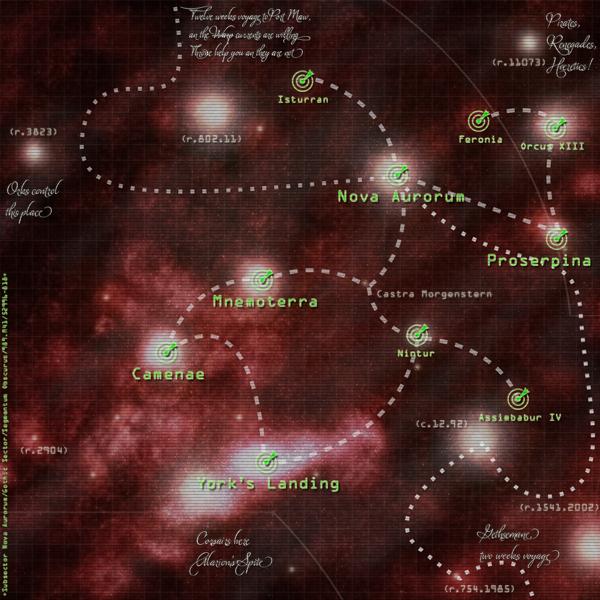 A civilian Shipmaster’s chart of Subsector Nova Aurorum, showing the major trade routes and worlds. Dense dust clouds shroud this large, hot world, and little light reaches the surface. Geothermal energy powers vast arrays of hydroponic grow beds. This densely populated Hive World, orbiting the companion star of a binary system, raises regiments of Camenaean Dragoon Guards for the Astra Militarum. Feronia is a night world, the petty intrigues of the noble families who dwell here playing out in perpetual twilight under the crystal domes that contain the planet’s artificial atmosphere. Recorded as a Feudal World as recently as M37, by the dawn of M41 the Ecclesiarchy had covered almost the entire surface of the planet with shrines, mighty cathedrals and devotional statuary. It is said of Isturran that the sound of a million voices raised in praise and worship of the God-Emperor is ever-present wherever you tread. The Order of the Sacred Rose maintain a convent here. Meticulously detailed records show this world was once a paradise. After millennia under the influence of the Adeptus Mechanicus it is now a world of adamantium and plasteel, choked with toxic emissions. Homeworld of the Legio Cornix (Storm Crows) Titan Legion. Nintur exports grox meat in vast quantities across the sector. The subsector seat, Nova Aurorum is a verdant paradise, sparsely populated by Administratum servants and the merchant guilds who regulate trade throughout the subsector. Dark rumours suggest that in the days the Emperor still walked among his people, Nova Aurorum was known by another name. A rocky super-giant, the vast mineral wealth of Orcus XIII feeds the furnaces and forges of Mnemoterra. Proserpina Agri-World Proserpina is virtually a Garden World. It hosts a vast network of what by Imperial standards are tiny farms, exporting produce of the very highest quality to the sector’s elite. A Civilized World through which flows the mineral wealth of the Vesynia system, York’s Landing is also home to the Fortress-Monastery of the Lightbringers Space Marines Chapter. Thought for the day: Without wrath we are nothing.